Presi and I have had lots of articles about sports and workout challenges. Our Fitness category is bustling with many articles, some of them hitting the top most read articles on the blog. However, to this day, neither Presi, nor I have run a marathon. 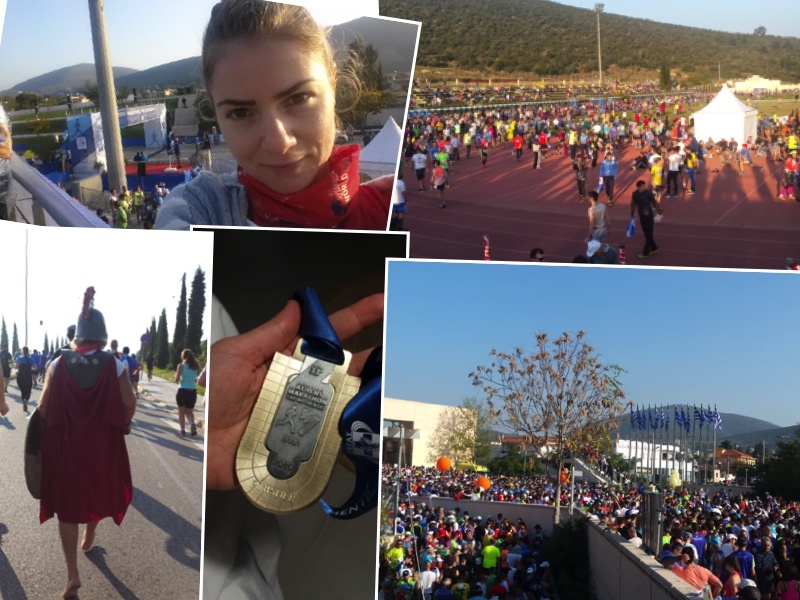 Thus, while very happy and proud of my girlfriend Anna’s achievement to finish the Athens Marathon, I asked her to share her story with us. I’m positive this will inspire you to take up a similar challenge or embrace running more. For me, the decision to run a marathon sprung from a rather newly formed passion for running which I developed while living in Belgium. The weather unfriendliness in this cute little country urges you to do things other times unthinkable, like running through parks, ridiculously early AMs or late at night, in the rain, by yourself for motives unexplainable to the outsider’s eye. My own mother, who ended up being my number one supporter, thought I was not in my full senses to just go out and run like that the entire time I was training. The questions are: how does running make you happier? And even more so, how does it make you want to run even more? Like about 42 km and 195 meters more? Biologically speaking, running releases endorphins and you are less stressed or less affected by the cloudy, chilly summers here in Western Europe. Socially speaking, you also become more connected to your city because you are outside more, crossing streets and parks, learning to love it in all its grayness and find people that share that same odd excitement. And spiritually speaking, you gain time for yourself, time in which you build a sense of self-coaching, developing more strength and motivation. You also get to learn all the hits on the radio and sing along on the streets if you like, people will think you are helpless anyway! Music literacy guaranteed! After several competitions of 20 or 21 kilometers I just felt I want more… more running, a bigger challenge and better results. 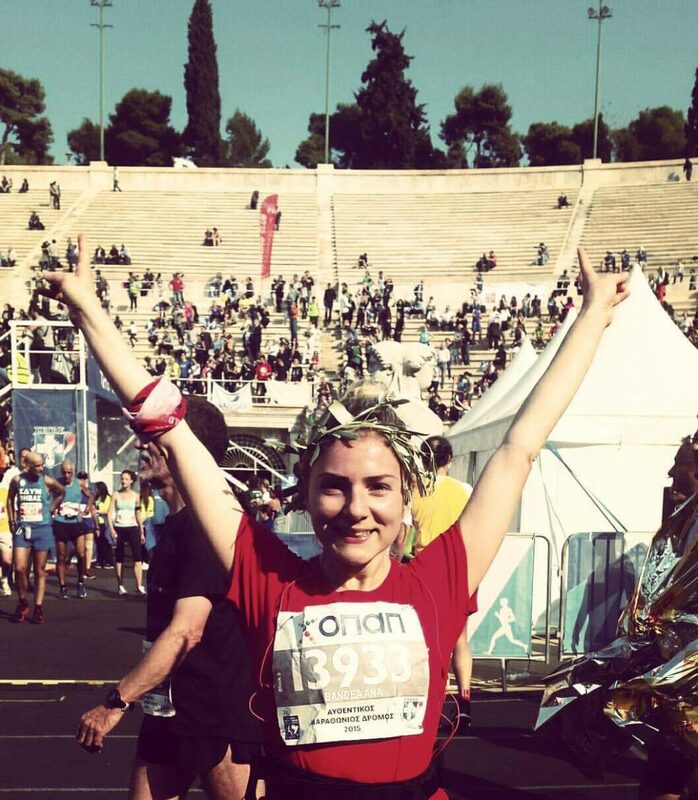 I heard someone dear to me talk about having run the Athens Marathon and I knew then and there I wanted to do it because I love Athens, I have Hellenic heritage and I want a new challenge to keep me running. And a good story to tell.Not a coincidence was the fact that in 2015 I turned 30. Some say at 30 a woman’s body waives in distrust leaving slowly her 20 year old silhouette behind. For me, it became also an opportunity to show that I can have a better performance than ever, that my body’s strength was unrelated to age and that I could start my new decade fearless and fit! I was recommended a web-based training program of 4 months with a schedule of 4 runs a week on various distances, constantly increasing the number of kilometers to give the body a chance to adapt to the effort, gradually building up resistance. This is the schedule I followed, but you have to cruise the Internet and check what rocks your boat (or running shoes)! I realized that it is not always easy to find time to run for hours. That sometimes you find time but you haven’t fed yourself properly. Or you’re lacking sleep. All these factors: proper eating, sleeping and exercise need to be combined with elements already existing in our life: job, relationships, friends, etc. becomes a challenge in itself. I did not want to become an antisocial (running) hobbit, so I actually asked people to run along and I got great support from loved ones! It’s not impossible, you just need to be mindful about all that you need to get your trainings done, communicate your priorities, respect your body and learn to fit more kilometers in your week. This experience has disciplined me and gave me more control over my life. I understood that I could do a lot more than I thought if I plan my eating schedule, work and sleep and manage my social life better. Another hint I’d highlight is merging swimming and biking with running and gym. You won’t get so bored (which you might at times and rightfully so) by just running and your body will build resistance. It’s said the Spartans used to do a different workout every day, never repeating the same exercise twice and although they lost to the Persians (shame really) they are renowned for their strength. This constant mix of workouts will allow you to keep your body enabled and alert, plus it’s more fun especially towards the last month when you’ll want to soak in the pool forever, never touching the ground again. The night before the marathon I was restless. In training I’ve never completed the full distance, but merely 32 kilometers on my longest run. So, I knew I’d wake up that morning to run more than I have ever had. I was going to do something for the first time in my life. This sensation gave me excitement and nervousness altogether. I barely slept because I couldn’t stop thinking that I need a good sleep! Everything went well from the start. It was a sunny day, how else would Novembers be in Greece? The positive energy reigned over the masses of runners. The best advice I could give to someone on the race is the one I received myself the night before the start: do not rush it, run at a slow pace in the beginning and don’t push to overtake others. The competition instinct might drive you to rush in front of others, as you aim to make space for yourself to get in front. But the best thing is to actually save energy from the first step. Everyone will start pumped and after kilometer 10 most will slow down while you will keep going in your relentless pace. You won’t have to overtake anyone: for those who will manage their energy poorly, will fall behind and the fast runners will clear the way going light years ahead. I ran with a lighter to moderate rhythm, I had patience which allowed me to save my energy and remain constant, finishing without injuries, without walls (which I had read about and I feared more than I did the darkness when I was a kid) and without a feeling of exhaustion. I took time to think about every step that I put in front of the next. How my foot was hitting the asphalt became an elaborate science especially after Kilometer 30. Fatigue can make one indolent and is likely to cause injuries simply because you don’t step right over one pebble. I managed to stay focused and I coordinated my every move. It helped I’d read about the race, I knew the obstacles and valleys and could not wait for those down-hills and re-fueling stations like a girl for her Barbie on Christmas morning. Although a Marathon is a physical competition, ultimately you are fighting a moral battle with kilometers. Knowing the route, paying attention to the details of your body from breathing, to your steps, as well as how often you drink water and how much you eat prior and during the race, will make the difference. In 4 hours of running alone (never mind the masses; you are there in your head with yourself), you “find” time to think about a lot of stuff. One of the thoughts that have accompanied me throughout this journey over the scenic hills and villages I encountered was the story of my family. Of my grandfather who walked all the way to Romania with his family, crossing the mountains of northern Greece, to find refuge and start a new life in Targoviste. I felt that 42 kilometers is nothing compared to walking as a child, barefoot across mountains to seek a better life. I felt privileged to wear a great pair of sneakers, to have stands with water every three kilometers and all the support in the world to complete this modest, in comparison, distance. I finished the race in 3 hours and 54 minutes smiling, with an olive headpiece that was offered to me by a child at the exit of Marathonas, that I’d worn throughout the race. At the beginning of the four-month program that I followed, it clearly explains that the success of the training stands in finding the right motivation. So, go back and think truthfully why you’d want to do this? My motivation was to prove myself I can overcome this distance and experience the feeling of crossing the finish line at the Olympic Stadium downtown Athens, in the place where it all started, in the city where I lived for 10 years that is part of me and whose little piece I remain. The finish exceeded my expectations. The atmosphere created by the organizers, applauding crowd, sky high endorphins, the sunny day and shiny white marble that surrounded me, gave me a feeling of greatness and power. Ultimately and to conclude, running a Marathon is a statement that if you set your mind to it, everything is possible. Limits are something we impose upon ourselves and something we ourselves can overcome.